Tourists visiting Sikkim will now have an option to order dishes made of organically grown vegetables in hotels and restaurants across the state. Earlier this month, the state tourism department had asked hoteliers to list at least one dish made of organic vegetables in their menu. The Sikkim Hotel and Restaurant Association, an apex body of hoteliers that has around 300 members, has agreed to the proposal. State agriculture minister Somnath Poudyal today said he will request each hotel and restaurant owner to adopt at least one village and procure organic items directly from the farmers there. "I held a meeting with the association in Gangtok recently and requested the members to adopt at least one village (each) so that middlemen can be avoided. Farmers would be able to sell their produce to hoteliers directly," Poudyal said in a press conference today. "Hoteliers have agreed in principle to include an organic dish in the menu but for that, they need regular supply. By adopting a village that practices organic farming, both farmers and hoteliers would be in a win-win situation." Sikkim banned the use of fertilisers and pesticides in farming in 2008 and now, 74,000 hectare has been brought under organic cultivation across the state. Some of the locally grown organic vegetables are potatoes, spinach, peas, beans, tomatoes, cabbages and cauliflowers. On January 16, Prime Minister Narendra Modi declared Sikkim as the first state in the country to practise organic farming. 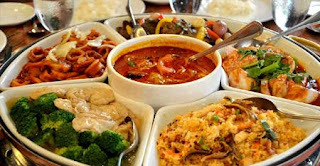 However, the hotels and restaurants mostly use vegetables and fruits brought from Siliguri. "We are yet to ascertain the total requirement but we are confident that locally grown vegetables are enough to cater to tourists in peak seasons. Organic items have high nutritional value" said agriculture secretary, Khorlo Bhutia. President of Sikkim Hotel and Restaurant Association, Pema Lamtha, said they will discuss the proposal to adopt villages. "We have agreed to include organic food in the menu although it might be slightly more expensive. We will hold a meeting with farmers to work out the modalities. The rates could be worked out later," he said. On February 8, tourism minister Ugen Gyasto Bhutia had requested hoteliers to serve organic food. "We want at least two-three organic dishes in the menu. Items can be decided by the hoteliers," he said.